How to escape the summer crowds! Summer is at its height, and so are the annual temperatures. Add the high season crowds and you have the recipe for a frustrating visit to the island and the Amalfi Coast. Here are a few tips on how to enjoy your holiday, even in August. This is the month in which everyone seems to be on vacation: huge yachts drop anchor below the Faraglioni, paparazzi cruise the restaurants and clubs in search of stars to photograph, and it can be hard to find a free spot on the beach. August is often the hottest month of the year, and temperatures soar while the humidity can try the patience of even the heartiest travelers. At night, the island generally cools off, and by the end of the month, summer thunderstorms bring down both the heat and the humidity. The most important thing to put in your suitcase is your bathing suit, followed by light clothing and sun block. Throw in a pair of comfortable low sandals, and a rain jacket if you are visiting at the end of the month, along with a light sweater or wrap for going out in the evening in case the temperatures dip after a thunderstorm. Get away from the crowds! 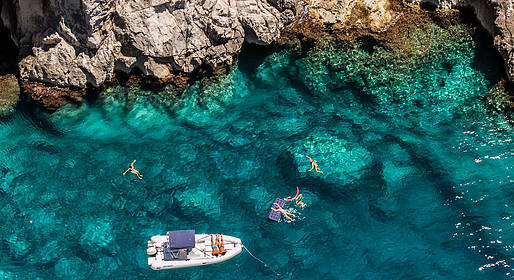 Rent a boat and take a tour along the coastline dotted with caves and coves, where you can find a corner of the sea and coast all to yourself even on the most crowded days of August. Here, you can take a dip in peace and quiet, with the sound of the sea breeze and cicadas as your only company. We recommend booking a boat with a skipper at this time of year, since the water can be crowded with other vessels, making navigation difficult if you are not very experienced at sea. This is not the time of year to make last minute plans. Book everything in advance, especially restaurants for dinner and sun loungers at the most popular beaches. .
Avoid taking a day trip to Capri, if not by private boat. The ferry is too hot and crowded for a single day, so plan to stay over on the island at least a night or two, spending the day on the beach and taking the cooler afternoon hours to visit the island. This is the only way to enjoy your visit without being disapponted by the chaos and crowds!